The Museum of American Finance is one of eight museums offering free admission and discounts as part of the new Downtown Culture Pass. LOWER MANHATTAN — Hoping to lure more tourists to lower Manhattan, eight museums are banding together to launch the Downtown Culture Pass. Starting Thursday, those who buy the $25 pass will receive three days of free admission and discounts at eight museums south of Chambers Street. More than 6 million tourists already come to lower Manhattan each year, and many more are expected once the 9/11 memorial opens next year, said Liz Berger, president of the Downtown Alliance. Berger hopes the new museum pass will convince those visitors to spend more time downtown, patronizing additional cultural institutions and local businesses. "The Downtown Culture Pass will turn a day trip into a full-fledged vacation," Berger said as she and other neighborhood leaders unveiled the program Wednesday morning. Downtown community and cultural leaders gathered Wednesday morning to announce the new pass. Participants include the Fraunces Tavern Museum, the Museum of American Finance, the Museum of Jewish Heritage, the National Museum of the American Indian, the New York City Police Museum, the 9/11 Memorial Preview Site, the Skyscraper Museum and the Tribute WTC Visitor Center. While some of those institutions already offer free admission, it would still cost over $70 to visit all of them, said David Cowen, president of the Museum of American Finance. 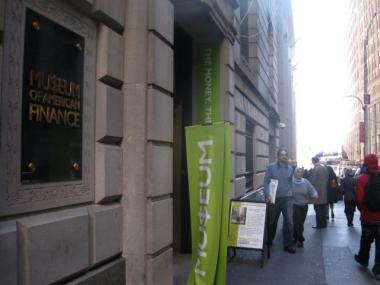 In addition to covering admission, the pass also offers a 10 percent discount at many of the museum shops and a 50 percent discount on Wall Street Walks tours. The culture pass program will run until Feb. 28, and if it is successful it may be extended further. The Downtown Culture Pass costs $25 for adults 18 and up, $15 for ages 13 to 17 and $5 for ages 6 to 12. Visitors can purchase it at the Museum of American Finance, the Museum of Jewish Heritage, the 9/11 Memorial Preview Site or online.